Kingdom Konsultant Travel Blog: BRAND NEW! 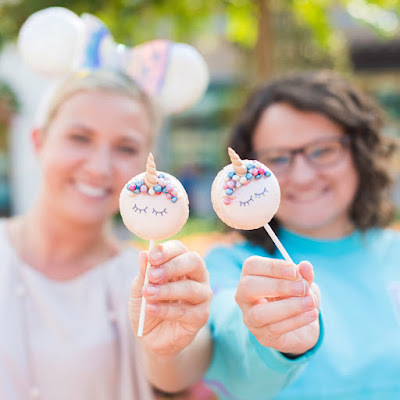 Iridescent Snacks at Disney! BRAND NEW! 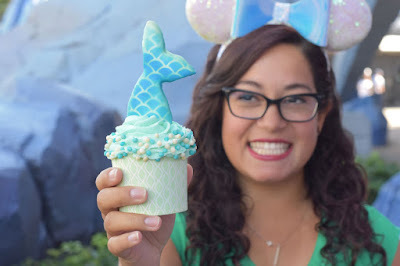 Iridescent Snacks at Disney! 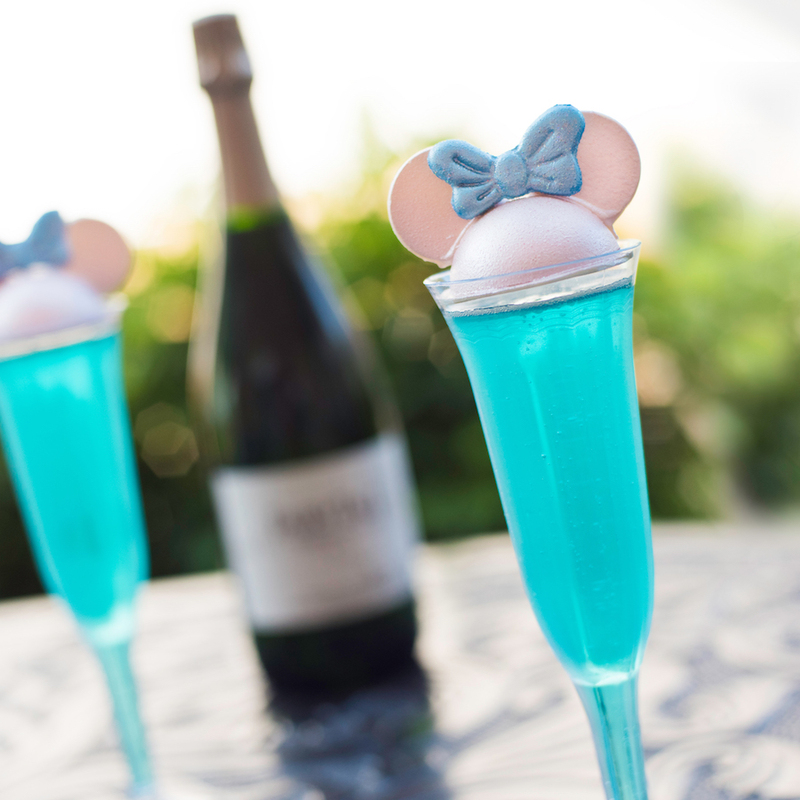 Hey there, Disney Fashionistas and Foodies! As we all know, Disney has gotten really good at capitalizing on what is hip and hot right now in the world of trends. First it was all about the rose gold, and then along came the millennial pink. Well, the newest color trend at Disney takes it's cue from the magical and majestic unicorn. Say hello to iridescent! 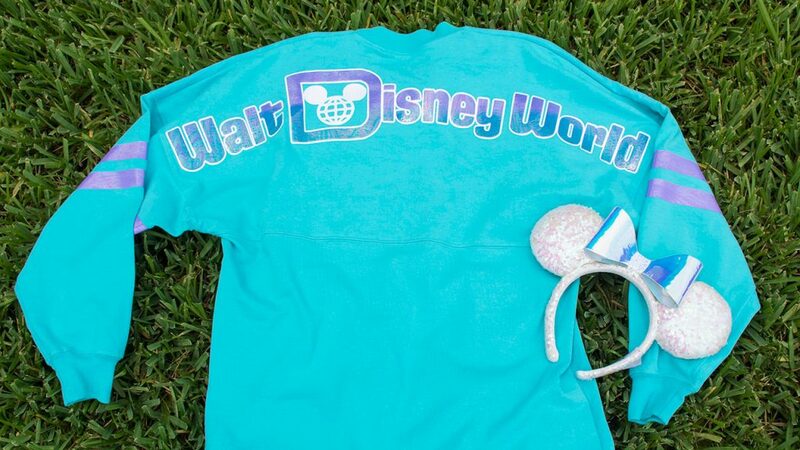 Fashionistas will find iridescent Mouse ears and spirit jerseys around the parks. And foodies... we got you covered! 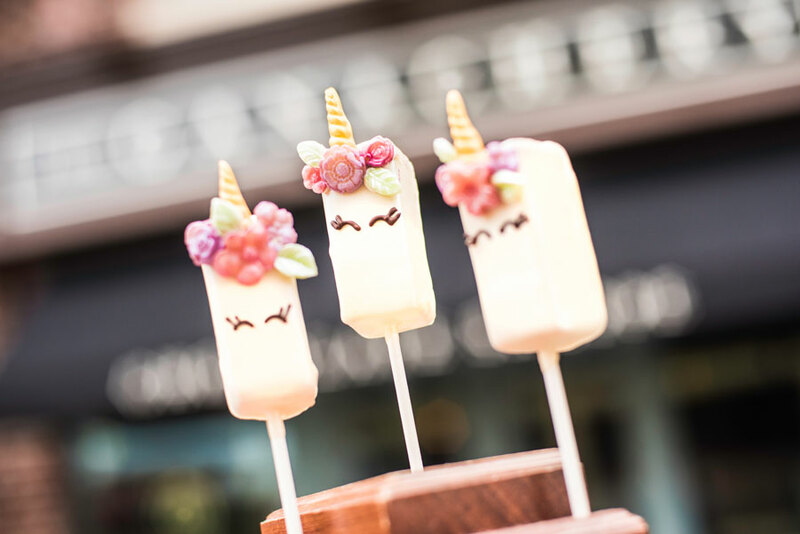 There are a number of rainbowy, sparkly, opalescent snacks and we got to try out some of them. Let's check them out! This beauty is a chocolate chip cookie base, with rainbow sprinkles and Oreo cookies scattered throughout. 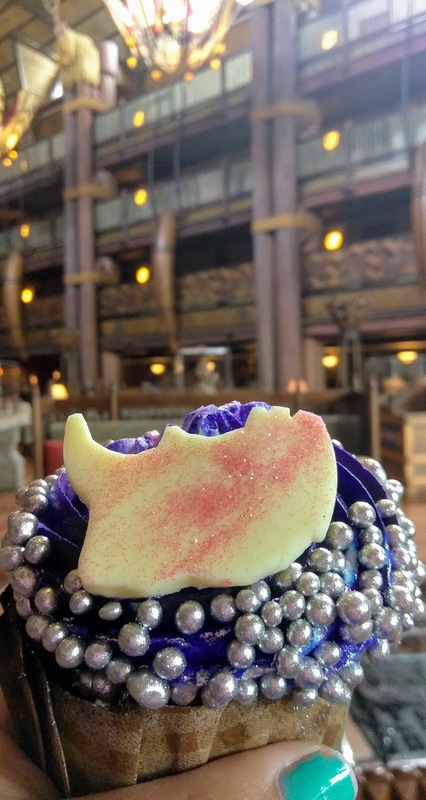 It's then coated in white chocolate, and adorned with it's own set of iridescent Minnie ears, made form white chocolate, iridescent sugar, and a shiny purple bow. Overall, it's undeniably cute, but a little heavy on white chocolate for me. (If you read my posts often, you'll know of my hatred for the stuff.) The Hubs tried it too and he likes white chocolate, so he was happier with it than I. He did say it was a bit dry, but otherwise tasty. I don't know that I would consider this one "iridescent", exactly. It's more like "galaxy" colors, with some shine to it, but I'll accept it. This is a chocolate cupcake, with a secret inside... caramel cream! It's sort of like a pudding consistency, and quite tasty. 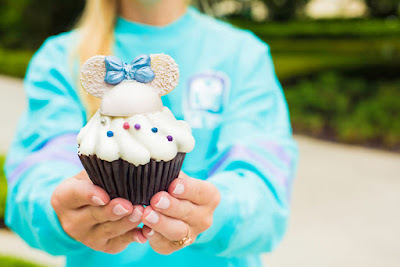 The cupcake is topped with brightly colored pink, blue and purple butter cream, crowned with silver-dusted crispy chocolate pearls, and then a white chocolate rhino, dusted in iridescent pink edible glitter is placed on top. 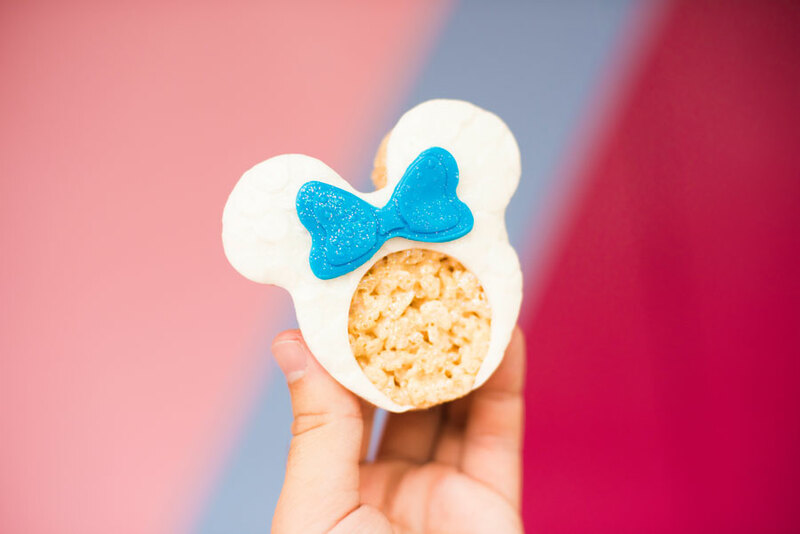 It's a really pretty cupcake and probably the most enjoyable snack of the day. 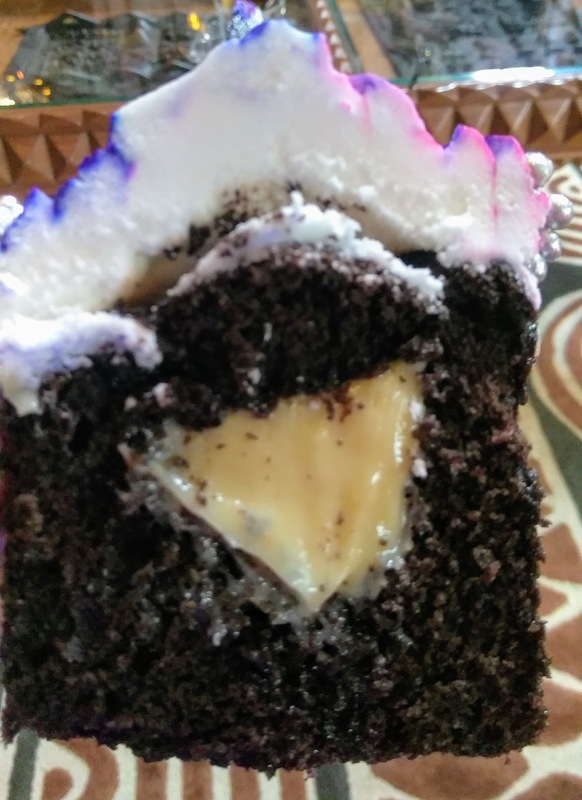 The creamy coolness of the caramel cream is a nice compliment to the chocolate cake. Disney buttercream is generally delicious and the crispiness from the pearls was a nice touch, as well. 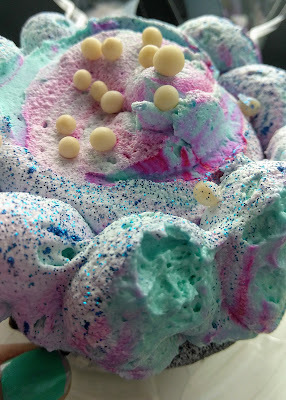 I highly recommend this 'wildly' good cupcake! 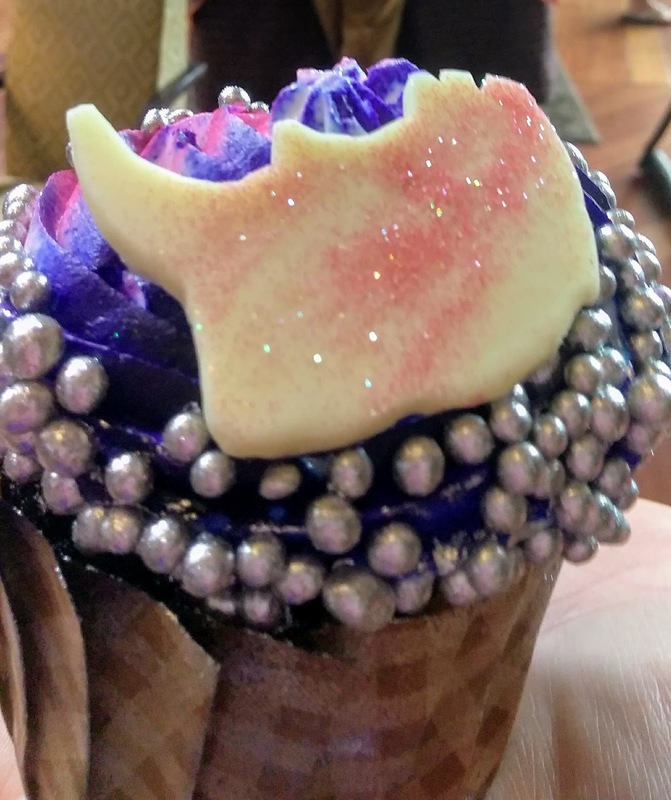 Probably the prettiest of the iridescent snacks, unicorn lovers will flip over this sparkly, magical cupcake. It is a yellow cake, filled with wildberry lemonade mousse, and topped with rainbow "baker's cream" whipped frosting. 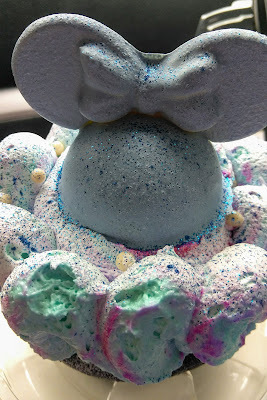 It then gets pink, sparkly white chocolate ears and a unicorn horn, and crispy chocolate pearls. I will confess that I did not try this one. 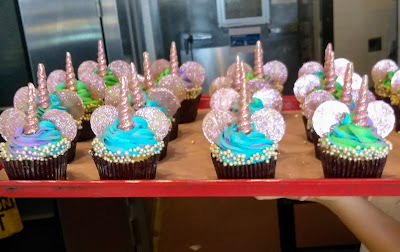 I do not like the whipped topping frosting that is used on the BoardWalk's cupcakes and as I already covered, I despise white chocolate, so luckily, the baker let me snap a pic of the tray of these beauties coming out. She described them as being very light and refreshing. You'll have to let me know if you try one! Soooo fun! This cupcake looks like a cosmic, cotton-candy dream come true! It's a chocolate cupcake, filled with cotton candy flavored marshmallow filling. The topping is whipped, airy blue raspberry flavored buttercream, in an array of colors, and then it gets powder blue white chocolate Minnie ears, some crispy chocolate pearls, and a dusting of blue edible glitter. 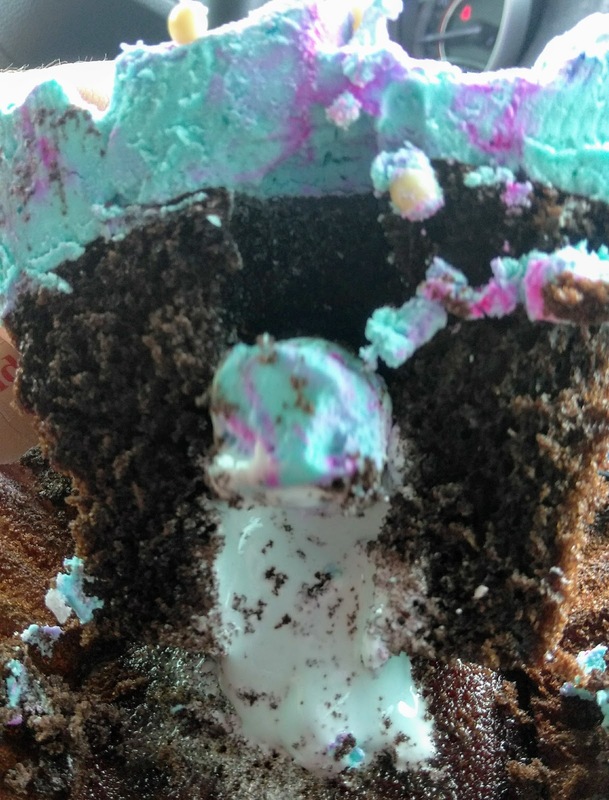 The cake was moist and delicious, and the cotton candy marshmallow filling, though a little runny, was super good. The buttercream was good, with just a slight hint of raspberry flavor. 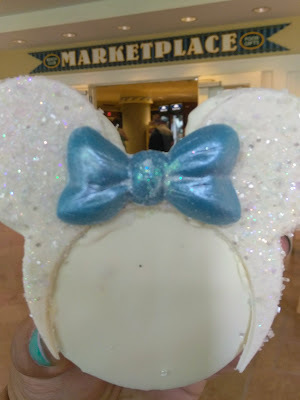 Of course, I gave the white chocolate ears to the Hubs. Booooo, white chocolate! I highly recommend that you let this one sit for a while. They are stored chilled and the icing can be a hard blob if you don't let it thaw out. Overall, a yummy and gorgeous option! That covers all of the snacks that I got to try. There are more, though, including a mermaid cupcake at The Magic Kingdom, an iridescent Minnie cupcake at Contempo Cafe at the Contemporary, an iridescent Minnie ears crispy rice treat from Fountain View in Epcot, a sparkling wine and unicorn macaron pop from Amorette's in Disney Springs and a unicorn ganache pop from The Ganachery in Disney Springs. If you're looking for a magical, iridescent treat yourself, check out all of the cool, limited time options at Walt Disney World! Need help planning? Talk to my friends at Kingdom Konsultant Travel and they'll be happy to make all of your Disney travel dreams come true! Until next time, Disney guys and gals, have a magical week!